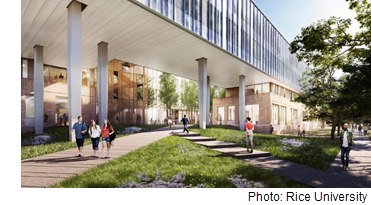 ​​​​ ​HOUSTON – Rice University will start construction on a $38 million building for the School of Social Sciences in mid-summer 2018. The 73,000-sf Patricia Lipoma Kraft ’87 and Jonathan A. Kraft Hall for Social Sciences will be located at the corner of College Way and Alumni Dr. This building will be the first along the university’s planned South Axis, which will eventually extend from McNair Hall to the corner of University Blvd. and Main St., and is expected to open by late 2019. The building will include the economics, sociology, psychology, anthropology, linguistics, political science, and sports management departments.